Cuvee Destin • 30A owner Tim Creehan will represent the Gulf Coast at the culinary event during Gulf Power's 2016 Economic Symposium. Among many speakers, "Shark Tank" investor Daymond John will deliver the keynote speech at the event. 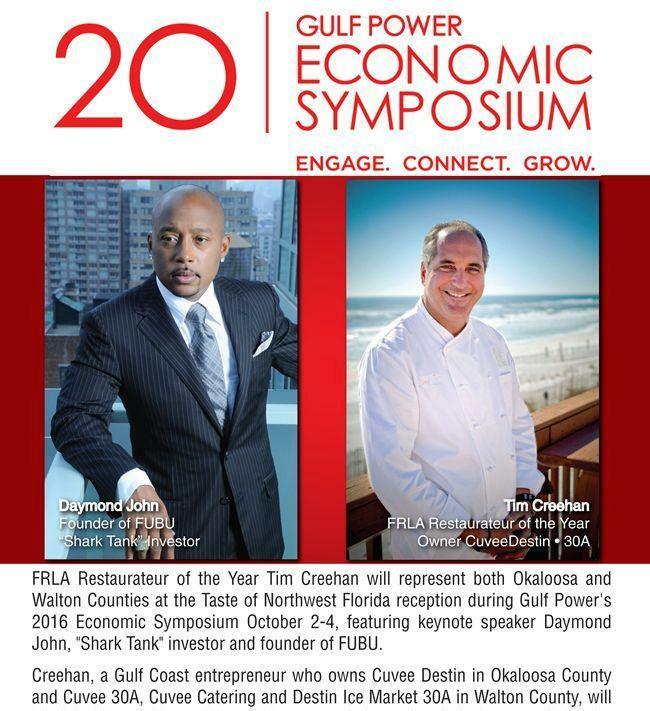 DESTIN, Fla. - Sept. 15, 2016 - PRLog -- FRLA Restaurateur of the Year Tim Creehan will represent both Okaloosa and Walton Counties at the Taste of Northwest Florida reception during Gulf Power's 2016 Economic Symposium October 2-4, featuring keynote speaker Daymond John, "Shark Tank" investor and founder of FUBU. Creehan, a Gulf Coast entrepreneur who owns Cuvee Destin in Okaloosa County and Cuvee 30A, Cuvee Catering and Destin Ice Market 30A in Walton County, will join Washington, Bay and Escambia county chefs serving their signature dishes for the event at the Sheraton Bay Point Resort in Panama City Beach on October 3, beginning at 5pm. The Taste of Northwest Florida event will follow a book signing by Daymond John for his newest publication "The Power of Broke". Visit GulfPowerSymposium.com for more information and registration. An entrepreneur in every sense of the word, Daymond John has come a long way from his $40 budget by growing FUBU into a six billion dollar brand. The Founder of FUBU, Presidential Ambassador of Global Entrepreneurship and Co-star of ABC's Shark Tank, is a celebrated pioneer in the fashion industry, best-selling author, branding guru and highly sought after motivational speaker. Visit DaymondJohn.com for more information. Often dubbed the Emerald Coast's celebrity chef, Creehan is a local media fixture whose reputation frequently lands him personal chef outings for numerous celebrities such as Amy Grant, Vince Gill, Bruce Willis, Cybil Shepherd, Timothy Hutton, Debra Winger, and Dallas Cowboys owner Jerry Jones. His recipes have been featured on Emeril Lagasse's television show, and he recently served as special guest Chef de Cuisine at the Sundance Film Festival, where he fed flocks of the famous at the organization's Entertainment Tonight/Getty Images/Gibson Guitar Lodge, including Matthew Broderick, Tom Arnold, Alan Rickman, John Legend, and many more. For more information about Tim, visit http://www.TimCreehan.com.